Asia Program Director Trishala Deb spent time with Shashi Ji Tyagi of Gramin Vikas Vigyan Samiti (GRAVIS) during her recent trip to attend a U.N. meeting in New York City. In late 2017, GRAVIS received the Jamnalal Bajaj Foundation Award for Outstanding Contribution to Constructive Work, an award for promoting Gandhian values, community service, and social development. GRAVIS works with poor, rural desert communities in the states of Rajasthan, Uttarakhand, and Uttar Pradesh in northern India. Rooted in participatory community development, GRAVIS’s work has reach 1.2 million people in the area. Through a myriad of programs, they have organized around health, income generation, gender rights, education, water resource development, social progress, and much more. Trishala Deb had an opportunity to speak with Shashi Ji Tyagi about her work, the current situation of communities in India, and the work of Kasturba Gandhi – a fellow fighter in the struggle for poor people’s rights. Following are highlights taken from a transcription of their conversation. T: Land rights are incredibly important. When it comes to ending poverty, there has to be land rights. But what we see around the world, in the US, in China, in India, the government is selling and privatizing land. So how do we understand and work towards land rights at a time when there is so much privatization? S: It’s a serious problem nowadays. We are not working directly for that now, but one of our friends is working for land rights. He did a march to Delhi and the march was so successful. The government asked them to stay in Delhi and discuss with him. Some promises were made, but things are still ongoing. Recently, our government has put a ban on the place where people were free to come, sit, and make demands. Now they said no, that it is not good to do that because it is near the heart of the city- so they have banned it. Now people are fighting for this space and cause. It’s not good when the government is using money for tourism or for big business, and people are becoming landless. We are having a march with many different organizations which are working on equal rights – from land rights, to pension rights, to talking about disparities with men and women, caste disparities, and religion disparities. T: Do you think that the situation for women is better today? Because it seems to me that there’s so much violence, that the situation for women sometimes is worse. S: It’s getting better. The violence…was hidden [before]. Now women have some power. I wouldn’t say it’s more now, it was just hidden. Women should share the labor at home, and then they should work outside, like Gandhi was teaching. My husband shared that also. He was cleaning the floor. He was washing the clothes. It requires this understanding. Sometimes I would be the one going to the fields, and the children were at home with him. Other people learned from him. We were the example. In addition to shared labor, [we] shared property as well. We decided that we would deal with quality education for our children. So both became doctors. T: How should women with political power further the movement? S: It’s a really difficult thing. Politics has to do with policy, but some women are doing good work. They have no big power to change the system. One man and one woman at a time, that will balance the system. T: I saw an interview with Dilma Ruset, the former president of Brazil. During a conversation she was leading at the UN, one of the things that struck me was when someone asked her a question about sexual violence in Brazil, she was able to tell the audience exactly what happens when women report sexual violence. She could tell them what the hospitals do, what the police officers do, what the counselors do, what the legal system does – she knew the entire system. I was so struck by that, because no male president ever can tell you the answer to this question. They have no idea what happens to women. She’s the first president I’ve ever heard that understands a basic reality for regular women. It made me think what it would be like, for more people in parliament to have a basic understanding of the reality of women without power. It’s one thing to understand what happens to middle class women. It’s another thing to understand the reality for poor women. S: That’s the reality everywhere in the world. If the [gender] balance is missing in meetings, politics, or in job opportunities, women are less. These things have to be discussed together, then and only then the time will come that there will be a good balance. T: And so, in the villages that you work in with GRAVIS, what are some of the cultural changes that you’ve seen happen in the last 20 years? S: Some freedom is coming in the women’s lives, due to education and due to their work. They are the earning members of the family. That has given them some power. But even working women are suffering with the double burden of work [inside and outside the home], and that is also changing a little bit but not on a big scale. T: How do you think mobile technology is changing the culture? S: In some ways it’s good. But it’s creating the ideas of unfaithful husbands and wives. If a women is using a phone, her husband and family think that she has another relationship. T: Can you tell me a little bit about the work that you and Kasturba [Gandhi] did, alongside Mahatma [Gandhi]? S: Kasturba went to [South] Africa with [Mahatma] Gandhi while he was practicing law there. In the beginning she was learning how to live in a different country and how to raise her children. [To save face], Gandhi responded [to her], “You were supposed to clean the toilet and you were not doing it”. Gandhi learned that she was fighting for truth, and that she had a strong character. She was always fighting for rights with Gandhi. After their work in Africa, they decided to come back to India to continue the work with the struggles India was facing. In India, Gandhi was told that he should work not to earn money but to solve the peoples’ problems. So Gandhi discussed with Kasturba what they should do, and she agreed to continue the work in India. They didn’t live in luxury. Gandhi was given some land by the river [in Gujarat], where they made their home and started their lives with their children. So then Gandhi [went] out to see how people were living for one year. Gandhi and Kasturba decided that she will take all the responsibility for their home and he went and visited many communities and saw the problems many people were facing. When he came back to Gujarat, he settled a small setup of agriculture. There was also quite a good group running a community kitchen, and Kasturba was responsible for looking after the the kitchen. People said that if Kasturba wasn’t there, the people would [have been] hungry. She managed everything with equality and fairness. After [traveling around India], and after discussing with people and Kasturba, Gandhi decided to write a letter to the British government about the conditions of the people in India. He then discussed with Kasturba to get ready to go [on the Great Salt March]. Then Gandhi declared in a meeting, they were going to march, and if someone didn’t want to join, then they shouldn’t. He vowed to only return when India gained freedom from the British. Because they were breaking the law, they were beaten by police and put in jail. 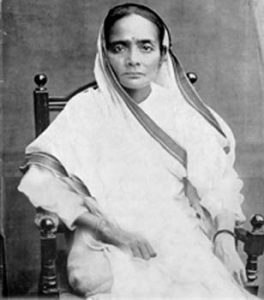 Kasturba’s faced suffering her whole life in freedom movements, [was arrested multiple times], and she never demanded anything from anybody. During the struggle, she contracted some diseases while she was in jail. When advised to go to the hospital after becoming very sick, she said “No, I’m not going to leave my coworkers, I’ll stay here.” And she died there besides her people. Her whole life was devotion. She was the person who left all her comforts, with only two pairs of clothes. [She was] always the person with the least amount of possessions while traveling to communities. She was a strong person to fight for rights. T: What parts of Kasturba’s story remind you most of your life or what parts do you relate to? S: Like Kasturba, I also got married and our families were well off. And what I found in the beginning was that I felt a little nervous about how I will go about these problems. But then I joined the people’s movement with my husband. When I was walking with the people and looking at extreme poverty, which I hadn’t known, that motivated me to work for this, and be leading people, and always telling people how we have this freedom due to [Gandhi’s] efforts. I feel that it’s not good to live with luxury [when] people are facing severe poverty. So I joined this and I decided to work for the people who are living in isolation and severe poverty. We can work for them. T: And were there also moments like in Kasturba’s life where you had to argue? S: Yes, we have faced so many moments when we were working in tribal areas and there were big problems of land rights [and exploitation]. So we fought for land rights there, and did a fast for several days demanding that people should have land rights. It was around ‘74 or ‘75. T: Now that you’ve been organizing for so many years, what is your advice that you have for a woman who is 20 years old and who is in the same position as an organizer that you were when you were 20 years old? S: I would want to tell them that they should understand what they want to do. They shouldn’t follow the [societal] guidelines. But if they have faith in their own life, they can understand what they need in their friends, life. And if they want to work for [people’s rights], that will give you more satisfaction and more happiness.